The United States Bureau of Labor Statistics reports that approximately 1-in-9 workers earns a living through sales (U.S. Bureau of Labor Statistics 2011). Real estate professionals certainly fall into this category, but one would be mistaken to think that the other 8-of-9 workers are not engaged in some form of selling. While the majority of this group may not be employed in an explicit sales role, they are likely engaged in a non-sales selling role which involves persuading, convincing, and influencing others. MBA graduates sell employers on their potential, physicians sell patients on treatment options, entrepreneurs sell investors on their ideas, and managers sell direct reports on new company initiatives. Additionally, social media sites like Facebook, Twitter and LinkedIn are used as platforms for individuals to sell themselves. All of these non-sales selling activities occur through myriad forms of presentations and pitches. The concept of selling has changed more drastically over the last decade than over the previous century. Traditionally, sales transactions have been based on the guiding principle of caveat emptor - buyer beware. Due to the growing parity of buyer and seller information, though, this guiding principle has changed to caveat venditor - seller beware. This transformation can most easily be explained through the used-car sales example: buyers (traditionally lacking information) used to be at the mercy of the used-car salesperson for information on a car. Access to information has transformed this sales opportunity into a situation where the buyer is often more informed on a specific car than the car salesperson. 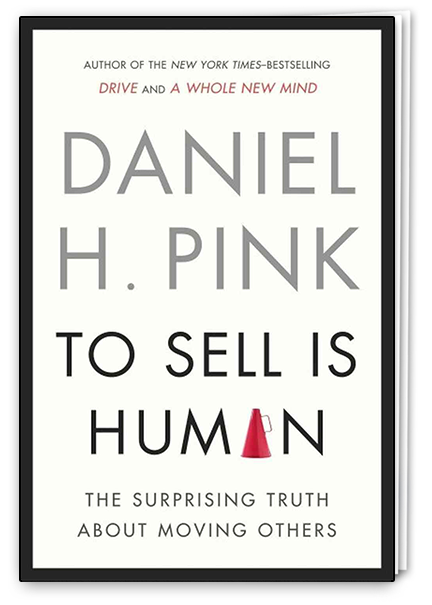 In To Sell is Human, Daniel Pink urges readers to rethink the idea of sales. Pink provides insight on how selling applies to everyone in a traditional sales role and those in non-sales selling roles. Pink focuses on the new ABC's of selling - attunement, buoyancy and clarity - which are the new requirements for influencing consumers in the 21st century. While the new ABC's have direct implications for real estate agents and their customers, the following ideas are applicable at every level of the sales organization. The principle of attunement involves customizing or adjusting one's actions or viewpoints to that of another person. Attunement is all about perspective: does the salesperson examine the situation from her own perspective or does the salesperson have the capability to step outside her own experience to consider the motivations or perceptions of another individual? Consider the three laws of attunement to enhance your ability to influence others. The first law is to increase your power by reducing it. The ability to understand and adopt another's perspective mattered less when information was only available to the salesperson and consumers had limited buying options. As access to information has become available to consumers, salespeople must recognize that they are not necessarily the ones with power in the sales transaction. Beginning a sales transaction under the assumption that the salesperson holds less power than the buyer can help the salesperson see the buyer's perspective more accurately. In turn, this will help the seller influence the buyer more effectively. The second law of attunement is to use your head as much as your heart. This law introduces the idea of social cartography - identifying the key players in the sales transaction and working to understand each person's biases and preferences. Using your head will not only ensure that salespeople do not exclude a key player from the conversation, but also that time, energy and effort will be allocated appropriately in the relationship. The last law of attunement calls for mimicking strategically. Studies have shown that negotiators who mimick their opponents' mannerisms were more likely to negotiate a deal that benefited both parties. This idea stems from the fact that individuals subconsciously look for cues in the environment to determine who they can trust, including matching behavioral patterns to get in-sync with others. Mimicry must be subtle and strategic and can include the crossing of arms, leaning back, taking a sip of water or the mimicking of an expression. How are you working to customize and/or adjust your perspectives to those of your clients? Are you maximizing your ability to influence key players in the sales process? Real estate professionals know that they must be able to contend with the throng of rejections, rebuffs, and refusals that come with a sales role. Effective agents must be able to stay afloat and effectively manage negativity - agents must be buoyant. Many successful sales and motivational strategies encourage a period of personal reflection before a sales encounter to think positively and envision success in the transaction. This is called positive self-talk. On the other end of the spectrum, salespeople work to minimize negative self-talk that emphasizes weaknesses and insecurities. While it may seem obvious to engage in positive self-talk versus negative self-talk, studies have actually shown that the most effective form of self-talk includes asking interrogative questions about one's ability. Examples of interrogative self-talk might include questions like, "Will I be able to successfully conduct this meeting?" or "How can I clearly present the benefits of using a realtor versus engaging in a FSBO transaction?" Research shows that such interrogative questions have longer-lasting effects than the temporary emotional boost of positive self-talk. The key to leveraging interrogative self-talk is to take the questioning one step further by answering the question immediately in writing. If a real estate professional asks, "Can I convince my client that I can find a home-solution that will work for her? ", the agent might respond by reiterating that he has done so successfully in the past, or that he has unique industry-specific knowledge about the real estate market that will surely help in the home-buying process. Additionally, salespeople must actively seek out positive interactions to boost their positivity ratios. Studies have shown that sellers exposed to a positivity ratio of 3-to-1, meaning that the seller encounters three positive interactions for every negative interaction, are significantly more productive than sellers with lower positivity ratios. However, it is important to note that there is such a thing as too much positivity. Sellers who were exposed to positivity ratios that were higher than 3-to-1, experienced a decline in productivity. Because information is abundant and readily accessible for clients and salespeople, the ability to influence or persuade a prospective client may depend less on problem solving and more on problem finding. Skilled salespeople are skilled problem-solvers and can accurately assess a potential client's needs and work towards amicable solutions. In order to become better problem-solvers, real estate professionals must be adapt at clarifying - or the capacity to help others see their situations in a different light. Ultimately, the salesperson's goal is to help the client identify problems that she may not have known she possessed. Consider a client who tells you he wants "more room" in his next house. He may believe that adding an additional bedroom or a formal dining room to his home search requirements will help fulfill his goal of having more room for storage, entertaining, etc. What the client may not be considering, though, is that configuration rather than total square footage may have more of an impact on his perception of the amount of room available in the house. Being able to clarify and identify the root of a customer's problems can lead a skilled salesperson to help the customer find the most appropriate solution available. A house with a more open-concept layout may actually fit his needs better, even though his perception of space may have been previously dictated solely by the number of rooms or total square footage available in the house. A consumer will be more likely to buy (and buy again) from a salesperson who is able to truly uncover and help clarify his main needs. Bringing clarity to a sales encounter depends largely on the salesperson's ability to ask the right questions. Prior to a sales encounter, real estate agents may consider generating a list of questions for a prospective buyer. Categorize the list into open-ended and close-ended questions and consider the advantages and disadvantages of each. Finally, re-work and prioritize the list of questions based on these advantages and disadvantage and make sure they will help bring clarity to the buyer's situation. Through this process, the agent will ensure that she is able to gain the most valuable information about the client in order to most effectively help meet his needs. Whether or not "sales" is officially in our title or job description, each of us engages in some type of sales role through our work and personal lives. With Daniel Pink's insights on the changing sales environment, real estate agents can leverage the concepts of attunement, buoyancy and clarity to maximize sales results and effectiveness. U.S. Bureau of Labor Statistics (2011), "Occupational Employment and Wages Summary," (accessed July 16, 2013), [available online at: https://www.bls.gov/news.release/ocwage.t01.htm]. Pink, Daniel (2012), To Sell is Human, New York: Riverhead Books, Inc.
Dennis is from Boston, Massachusetts and received an MBA in Health Care Administration from Baylor University. Dennis' professional experience includes over 6 years of marketing and project management experience in IT, an administrative residency at Vanguard Health Systems, and over 7 years of community service. Dennis works as a consultant within FTI's Healthcare Solutions group, focusing on productivity, performance improvement and population health models.